Jim Gerritsen Inducted into '50 Mainers' Class of 2017. Roguing This Year's Potato Crop. Notable Quote: Wendell Barry on Nature's Justice. Recipe: Whole Wheat Raspberry Ricotta Scones. A Summer Flying By. 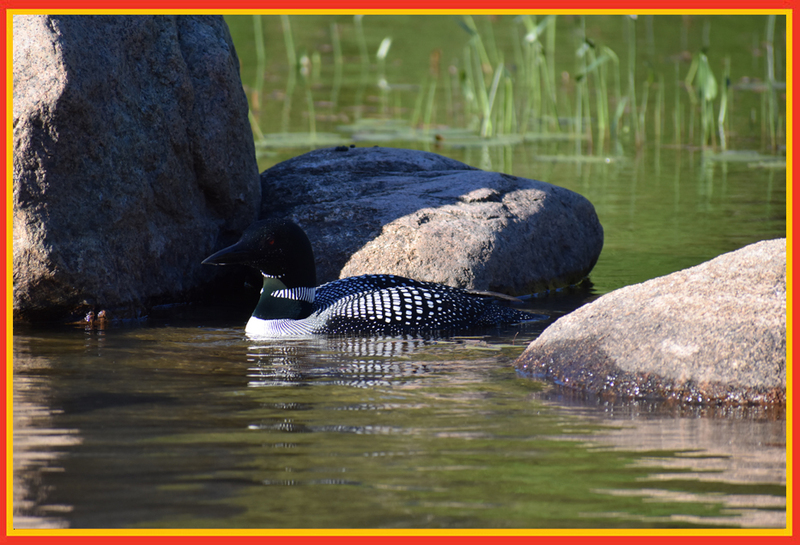 Loon in Acadia National Park. Sarah Gerritsen’s photography is on full display in this issue of the Wood Prairie Seed Piece. In June we took our five-day camping trip to Acadia National Park on the coast – an annual tradition for us going back twenty years. Earlier this month we also camped for three nights at the Abol Stream campground in the wilderness Baxter State Park and climbed Katahdin (70 miles southwest of our farm) on a rare day which was free of thunderstorms. Campsites 6 & 7 are the best – each have lean-tos and are right beside the crystal clear stream which serves as the camp’s water source. We’ve been a little short-handed this Summer and that has kept us very busy and has helped time fly by. Up until the last week or two we’ve had plenty of rain (5.4” in May and 4.5” in June) but July has given us less than 3” so far and we’re now setting up to irrigate. Crops look good. A lot of this year’s rains have come as hit and miss thundershowers so one farm may have plenty of moisture while another farm just a few miles away could be dry. In three weeks, school will start back up and then after that we’ll start killing early varieties of seed potatoes. We’ve had three nights this week when nights cooled down to the high 40s. Whereas it had been getting light at 4am, it’s now slipping closer to 430am when the daylight arrives. It’s easy to get up in the morning when it gets light this early. Wood Prairie's Jim Gerritsen Inducted into '50 Mainers' Class of 2017. Resident organic Wood Prairie Family Farmer Jim Gerritsen was recently selected by Maine Magazine as one of its '50 Mainers.' This is the fifth year of Maine Magazine's annual 50 Mainers selections which recognize Mainers who are working to help make Maine a better place. Last month, Jim & Megan traveled down to St. Joseph's College near Sebago Lake where a reception was held celebrating new and past inductees. Former Senate Majority Lead George Mitchell (Class of 2013) offered a brief keynote to those assembled at the Stone Barn, part of the college's fledgling sustainable farming operation. Jim Gerritsen, Wood Prairie Family Farm. Inducted into this, the fifth year of Maine Magazine's 50 Mainers. Each year - on a weekly basis - we "rogue" or walk through our field of organic seed potatoes checking the progress of the crop. We identify and remove off-types and plants exhibit symptoms of potato virus. These photos taken by Sarah show the process of roguing. Amy Driving Farmall 460 Tractor. The tractor pulls the roguing cart onto which the rogues are piled and Megan walks the rows. Sarah's Dog Hallie Loses Concentration. Meanwhile, Megan, Scott and Jim continue to rogue. Flags & Rogues. Megan carries out a rogued potato plant and a pile of diversion ditch flags which mark the rogues for the "diggers" to dig up. Old Tractors and New Potatoes. After decades of honest work old tractors keep on plugging away. Oldtimer Snowball. Since she was just a puppy many year ago Snowball has always accompanied us as we rogue. Notable Quotes: Wendell Berry on Nature's Justice. Preheat oven to 425F degrees. Line a large baking sheet with parchment paper. In a large bowl, whisk flours, baking powder, sugar, and salt together. Add the butter to flour mixture and cut with pastry blender until the butter is the size of small peas. Toss in the raspberries, and use the pastry blender again to break them in half. With a flexible spatula, add the ricotta and heavy cream to the butter mixture and stir them to form a dough. Add more cream, 1 T at a time, if needed. Use your hands to knead the dough gently into an even mass in the bowl. Transfer dough to a well-floured surface and pat into a circular disk about 1-inch high. With a large knife, slice into six equal wedges. Transfer the scones to the prepared baking sheet and bake for about 15 minutes, until golden at the edges. Cool on the pan for a couple of minutes before transferring to a cooling rack.